Trivia Question: What is the name of the intersection in Anchorage where the Ceremonial Start begins? Periodically I will post trivia questions for you to use in the classroom. You can use the trivia in a variety of ways. Challenge your students to find the answer to the questions before I post the answer, which will be within two days. Use the trivia as a discussion starter in class. Post the different trivia throughout your room. This week’s checkpoint focus will be Anchorage to Campbell Airstrip. 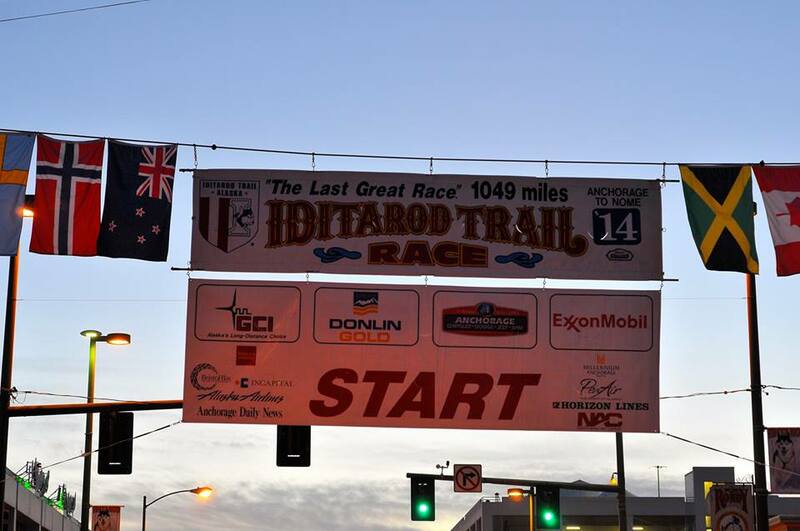 The Iditarod starts on the first Saturday in March. This year it will be March 7. March 7 will be a day filled filled with excitement, spectators, mushers, reindeer sausage, and of course, dogs. Dogs lining the streets of downtown Anchorage. 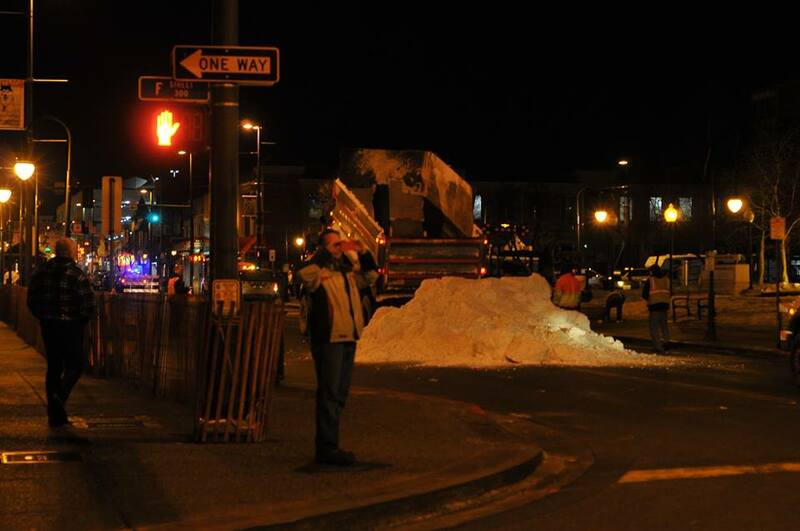 Friday night, workers will bring large amounts of snow to fill the city streets. 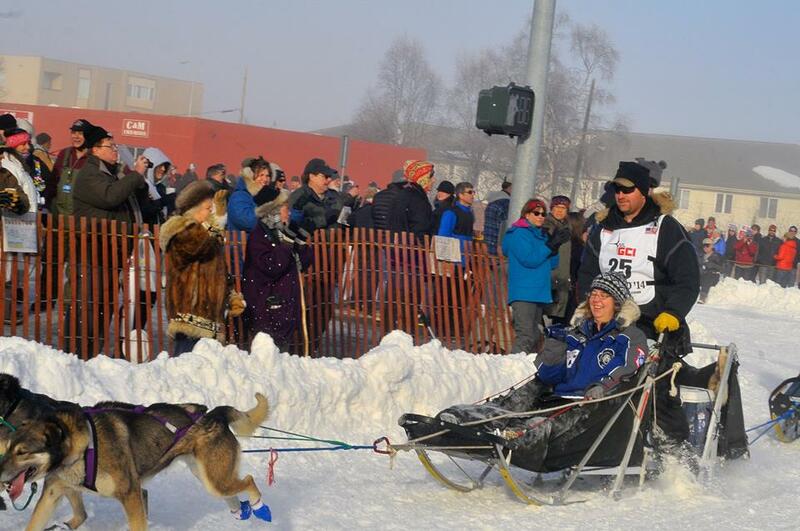 March 7, the ceremonial start, is like a parade of mushers and dogs. This day does not get recorded on the musher’s time. That will start in Willow on restart day. Each musher will have 12 dogs, a whip sled, and an Iditarider. On restart day mushers can start with 16 dogs. They are only able to use 12 on Saturday because 16 would be very powerful and we don’t want anyone to get hurt, dog or musher. Some mushers will save their best dogs for restart day and not even use them during the ceremonial start. The whip sled will also help control and slow down the team through the city. The Iditarider is a person who has bid to ride with a specific musher. Mushers are auctioned off prior to the race to raise money for the Iditarod. What an exciting way to experience the Iditarod; actually riding the first part of the trail with your favorite musher. The ceremonial start is an 11-mile adventure ending at the Campbell Airstrip. Compare these Anchorage fast facts with the same facts from your city/town. If you have read the post about the Iditarod trail map my students are making on my classroom wall, we are posting fast facts next to each checkpoint.